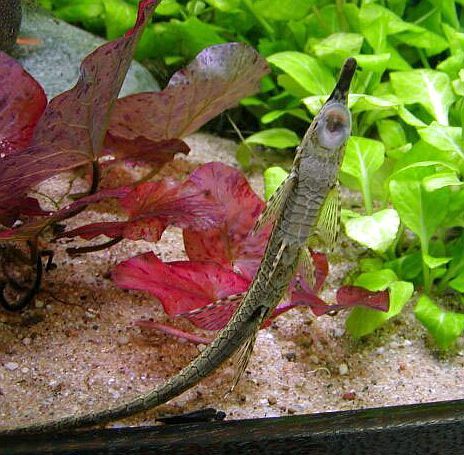 The Whiptail Catfish (Farlowella acus) is also known as the Twig Catfish, Stick Catfish, Farlowella or Whiptail Catfish by tropical fish keeping enthusiasts. They are found in slow moving rivers and lakes and are broadly distributed in the Amazon, Orinoco, Paraná, and coastal rivers of the Guyana Shield in South America. Farlowella acus is an armored catfish that has a very long and slender body. They are brown and black in coloration, and have an elongated nose. Like many other fish in the Loricariidae family, they have a sucker mouth that is designed to aid them in feeding on algae from the plants and decorations in the aquarium and rooting around bottom debris. The Whiptail Farlowella Catfish makes a wonderful addition to any peaceful freshwater community aquarium. The Whiptail Farlowella catfish should be housed in a densely planted, sand or fine gravel aquarium with high aeration and moderate water movement. The should be provided rocks and driftwood to mimic their natural environment and for them to hide. Farlowella cats prefer dimly lit conditions and need a 55 gallon aquarium or larger if housed with other species. Because they are not picky eaters, feeding the Whiptail Catfish is not difficult. They generally feed what is left on the bottom of the tank and they get most of their nutrition from left over food and algae. In newer aquarium setups with little or no algae present, supplement their diet with algae wafers , sinking herbivore pellets, a high quality flake food or freeze-dried bloodworms . Refer to the article on Whiptail Catfish for additional information on breeding the Farlowella acus. The Whiptail Catfish is not readily available for purchase but when available they are approximately 3″ to 5″ in length.